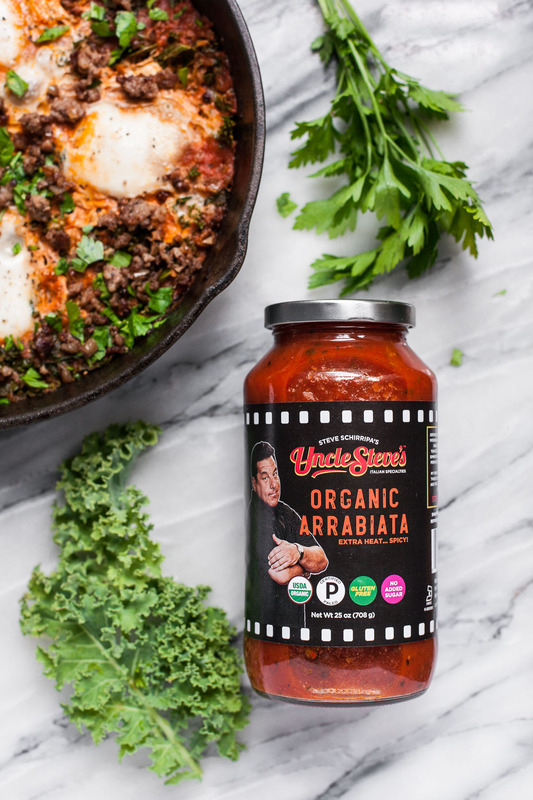 You can order Uncle Steve’s sauces online or check their store locator to find them near you. And in case you didn’t notice, these are Steve Schirripa’s sauces! They’re made with his mother’s recipe. If you’re a Sopranos fan like me, you surely recognize him as the actor who played Bobby Baccalieri. I’m also currently watching The Secret Life of the American Teenager (I can’t get enough teen drama TV) where he plays the father of one of the main characters and is affectionately nicknamed the “Sausage King” because of his successful meat empire. As a little nod to his portrayal of the “Sausage King”, I’ve included sausage in this eggs in purgatory recipe. Of course, the sausage also makes this breakfast extra tasty! These eggs in purgatory with sausage and kale are easy to make in about half an hour. You start by sautéing a little shallot or onion, and then browning the sausage with that. Next you add the kale, which lends extra nutrients and flavor to this high-protein meal, and cook it just until it wilts. You pour in Uncle Steve’s Arabbiata and some water, make four little nests with a spoon, and crack an egg into each one. Finally, cover the skillet and cook until the eggs are just almost the way you like them–they’ll continue to cook a little after you remove the pan from the heat. If you like runny yolks, check your eggs early and often! I like to finish this dish with a sprinkling of parsley for extra color and freshness. This right here is my breakfast of champions! And if you’re not as excited about a spicy breakfast as I am, this also makes a wonderful quick weeknight dinner. 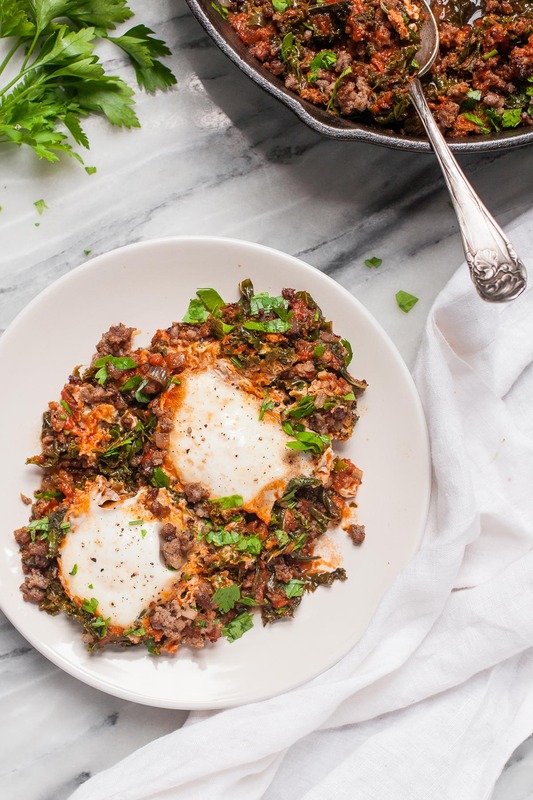 Eggs in purgatory with sausage and kale is a hearty and delicious breakfast that's Whole30 compliant and perfect if you like to start the day with a little heat. Heat the ghee in a large skillet over medium-low heat. Add the shallot and cook, stirring occasionally, for about 5 minutes, until somewhat softened. Raise the heat to medium-high and add the sausage. Cook, stirring occasionally and breaking up the meat with a spatula, until the sausage is browned and cooked through. If desired, take some sausage out at this point and reserve it to sprinkle on top before serving. Reduce the heat to medium, add the kale, and cook, stirring constantly, just until wilted. Pour in the arrabiata sauce and water and stir. Use a spoon to create four little wells in the sauce, and carefully crack an egg into each one. Cover the skillet and cook until the eggs are done to your liking. If you prefer runny yolks, start checking your eggs after three minutes and remove the pan from the heat when the whites are just set. Sprinkle with reserved sausage if you took some out earlier. Sprinkle the eggs with salt and black pepper, top with chopped parsley, and serve hot. *You can use any bulk sausage you like, or buy uncooked sausage links and remove the casings. Check the ingredients in your sausage carefully if you're doing a Whole30 to make sure there are no off-plan ingredients like sugar. This post is sponsored by Uncle Steve’s Italian Specialties. 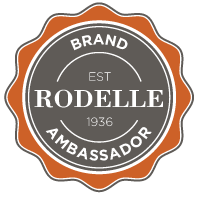 Thank you so much for supporting the brands that help keep A Calculated Whisk up and running! 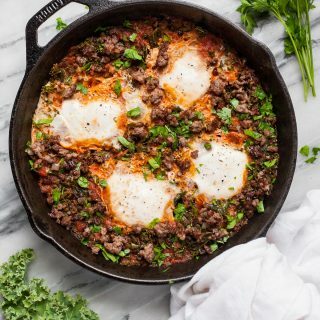 I love baked eggs skillet meals! So easy, tasty, and beautiful. Pinning! Thank you so much, Rachel! And thanks for pinning! I’ve never wanted to be in purgatory so badly 🙂 That deliciousness is drawing me in, a must make!! I love how hearty this meal is. It would be a he hit with my husband. Thanks, Emily! My fiancé loved it! Hmmmmmm this looks so delicious. I’ve never come across eggs in purgatory before but I can see why it is termed this way. Devilishly tasty!!! Thanks, Darryl! It’s a traditional Italian dish but I think shakshuka has gotten a lot more press recently. Eggs in purgatory deserves some time in the spotlight, too! I’m pretty sure I could eat this whole skillet, and die happy. Dayum that looks good. Haha yes! It’s so good! I love one skillet meals. And I love this recipe. These purgatory look so delicious ! I love baked eggs in the morning !! Thank you, ChihYu! Me too, especially with this spicy sauce! I love adding a bit of green to my breakfast skillets. This one looks so hearty and delicious. Thanks, Anya! I’m adding kale to almost everything these days! Your breakfast skillets are always so amazing, and I love how you added some kale to the mix too, I’m always trying to squeeze in another serving of veggies! Thanks, Kari! Me too, and I love kale in anything! I’m not eating tomatoes because of digestion probs but my gosh this looks incredible! I used to love eggs in purgatory, so filling and indulgent. Great that this has sausage added, too. I’ve never actually had eggs in purgatory but you have made me crave it 🙂 Looks like such a delicious and filling breakfast! It is! You should try it!! Love this! I’m a huge fan of shakshuka, so I bet this will be amazing. I’m going to check out that sauce! 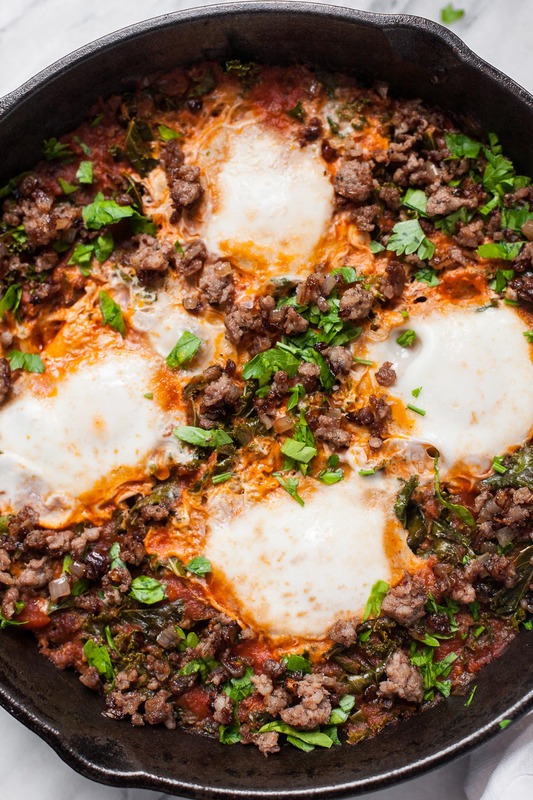 Yes, if you love shakshuka you will love this. And you’ll adore these sauces!! 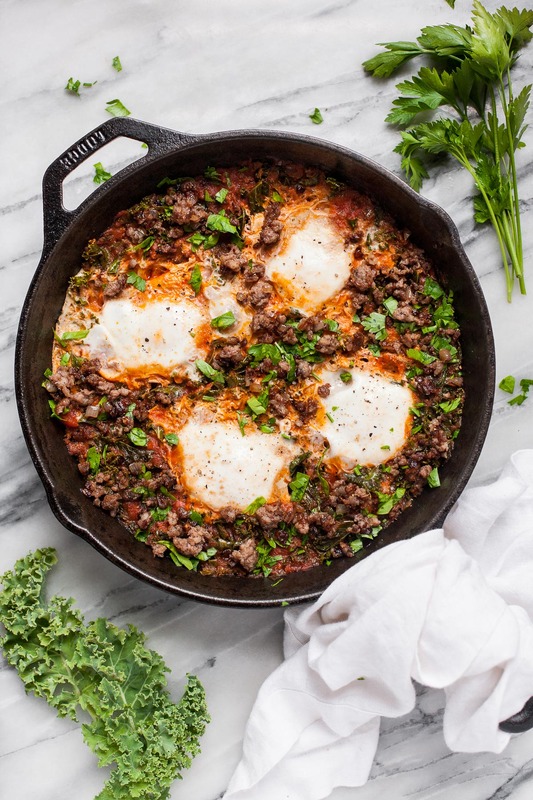 Love this play on shakshuka! Eggs, sausage and kale are one of my favorite combinations lately, I have a recipe coming soon with them too, ha! Great minds think alike! Thanks, Dana! 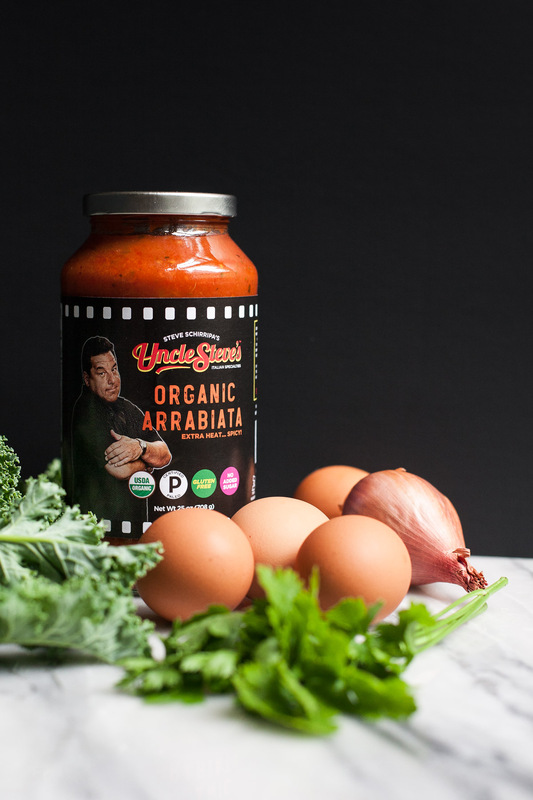 Yes, eggs and kale are perfect together, especially with this spicy sauce! Definitely getting some of that sauce! I am a HUGE fan of a spicy breakfast – I have kimchi on my breakfast most days! Thank you so much, Renee! I bet you will love these sauces. Glad to hear from another fan of spicy breakfast, too!